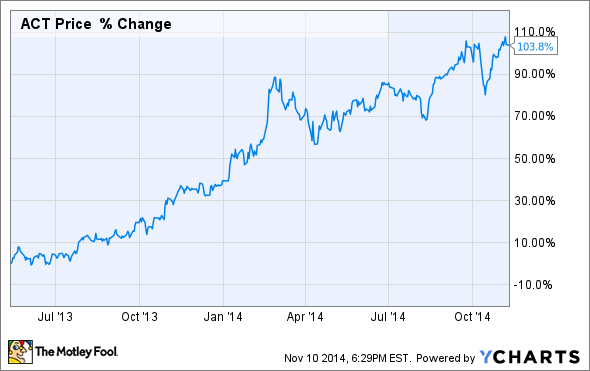 Specialty and generic drugmaker Actavis plc reported another monster quarter last week. Here are five things management wants investors to know going forward. The pharmaceutical industry has had a banner year in many ways, fueled by a slew of major drug approvals in recent years, numerous mergers and acquisitions, and significant corporate reorganizations that have helped to boost earnings. The specialty and generic drugmaker Actavis plc (NYSE:AGN) is a prime example of this industrywide phenomena. Since moving its tax base outside of the U.S. through its acquisition of Warner-Chilcott in 2013, the company has used its tax savings to buy up a host of branded drugmakers. The net result has been an earnings bonanza, causing its shares to more than double. With a stronger than expected third quarter on the books and more acquisitions coming into the fold, here are five things Actavis' management wants investors to know moving forward. Actavis' CEO Brent Saunders got the third-quarter conference call started on a high note, stating, "We're proud to report an 83% increase in total revenue to $3.7 billion." A big chunk of this upswing was due to Actavis' acquisition of Forest Laboratories. Specifically, Actavis reported a total of $507 million in sales for two key Forest products, namely its Alzheimer's medicine Namenda, and Linzess, indicated for Irritable Bowel Syndrome-C in adults. Given that Namenda is scheduled to lose patent protection next year, the company has been busy moving patients onto an extended release version of the drug dubbed "Namenda XR". Saunders let investors know that this process is unfolding as expected: "In our CNS franchise, we continued to focus on the conversion of Namenda IR to XR with XR sales increasing as we enhanced manufacturing capacity." So Namenda's patent problems shouldn't cause a major drop in revenue anytime soon. Saunders also noted on the call that the renewed direct-to-consumer campaign originally launched by Forest and Ironwood Pharmaceuticals (NASDAQ:IRWD) for Linzess is producing results. He said that the company saw growth continue for Linzess, benefiting from the resumption of DTC efforts. Lizness should therefore become an increasingly important value driver for Actavis moving forward. The seemingly ever-evolving nature of Actavis was a big theme on this quarter's call. For example, the company announced plans to acquire Durata Therapeutics (UNKNOWN:DRTX.DL) in October for its next-generation antibiotic Dalvance, recently approved by the Food and Drug Administration. On the call, Saunders updated investors on this process. "In early October we announced the proposed acquisition of Durata Therapeutics, a development and commercialization stage company focused on innovation in unmet infectious diseases. We're extremely excited about this acquisition," he said. Dalvance should be an important new medicine in the fight against acute bacterial skin and skin structure infections, although it will immediately face competition from Cubist Pharmaceuticals' (UNKNOWN:CBST.DL) rival therapy Sivextro. On a final note, management gave us an update on the regulatory process for its other IBS drug candidate, eluxadoline, acquired through its purchase of Furiex Pharmaceuticals last July. Sauders noted on the call, "We anticipate an FDA approval decision during the second quarter of 2015 and a possible launch of the product in late 2015 or early 2016. If approved, eluxadoline would represent a significant advance for patients with IBSD." Given that eluxadoline posted strong late-stage clinical trial results and has the potential to reach blockbuster status, this is an important regulatory review for investors to pay attention to going forward. Actavis' skyrocketing revenue in the third quarter looks like a preview of things to come for this serial acquirer. After all, the Linzess commercial campaign is only now picking up momentum, the Dalvance commercial launch is getting under way, and eluxadoline should be approved within the next six months. Actavis has also been linked to a possible mega deal with Botox maker Allergan (UNKNOWN:AGN.DL), and has even been approached by growth-starved Pfizer (NYSE:PFE), according to reports. In sum, I think big things are coming down the pike for this rapidly growing biopharma, making it a great stock to keep tabs on next year.